Yup, we got another bike. I'm not going to say how many bikes we own now, but I will tell you it's in the double digits if you count the kids'. But this one is different, really! 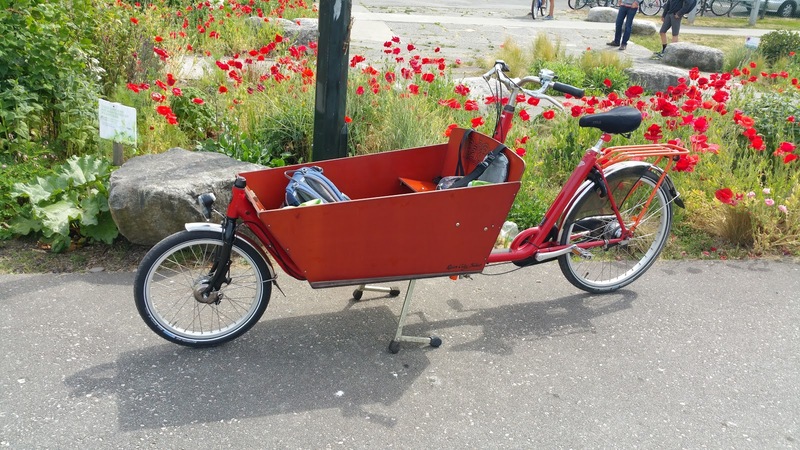 It's a Bakfiets, the original two-wheeled Dutch box bike. We originally wanted to get this type of cargo bike way back when we started thinking about it, before we even had children. 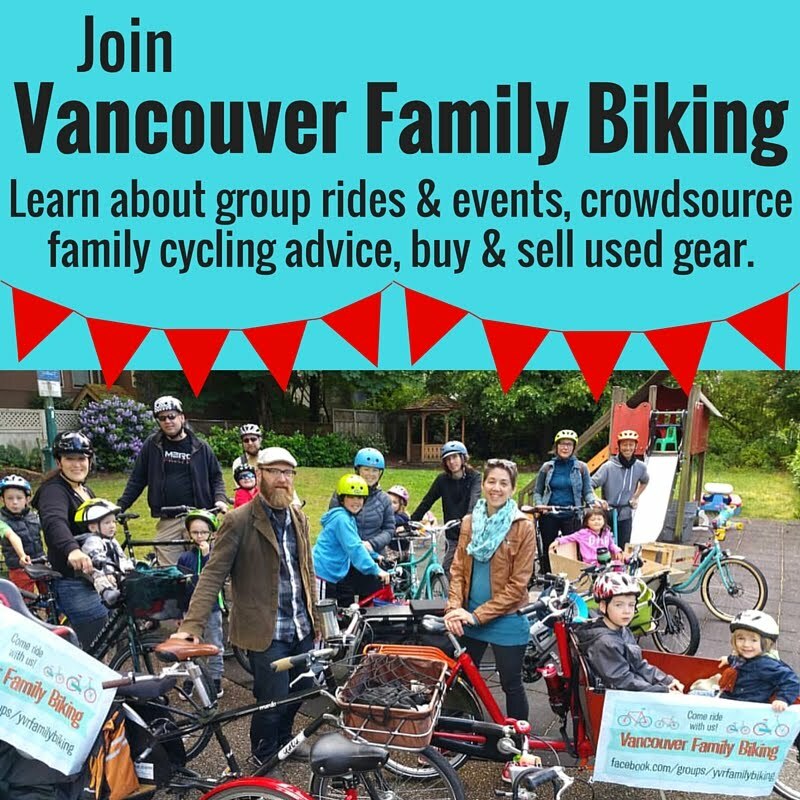 It wasn't a priority until we had two kids & the family biking gear we had just wasn't cutting it for Bronte & Linnaeus together. But having a single income in this expensive city meant we started looking at longtail cargo bikes, because they're generally less expensive than the longjohns. Bakfiets are still relatively rare here so they don't come on the used market very often, plus their resale value is generally quite high, so it was still less expensive to buy a new Yuba Mundo. After having the Yuba for nearly two years, we still wanted to have a bakfiets. Not to replace the Yuba, but in addition to it. But it was a bit of a pipe dream, as we don't have a spare $7000 lying around. 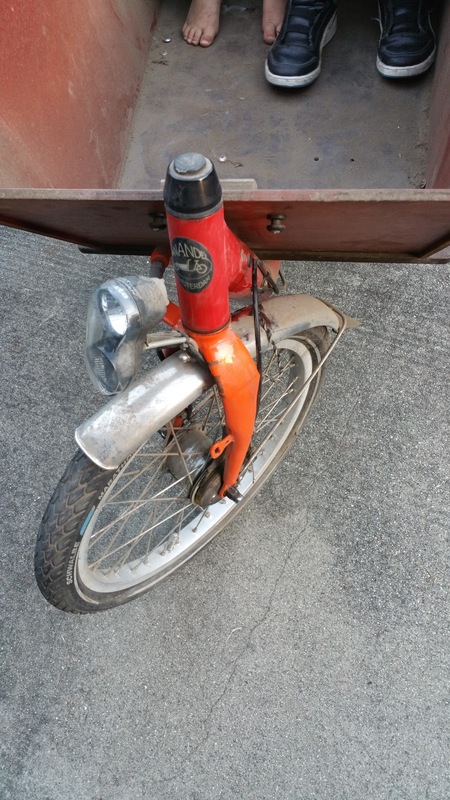 Unbeknownst to me, Oliver set up a Craigslist Alert for 'bakfiets' at least a year ago. Then it came. Early one morning, he got an email notifying him that someone in Richmond was selling a Bakfiets.nl for cheap! The catch was, the bike had been in a crash & was not rideable. Oliver emailed the guy immediately & we crossed our fingers, but expected not to be the first people to respond to the post. We'd been third a year or two ago when we'd noticed someone selling a bakfiets on Craigslist & missed out on it. But we heard back quickly--we were first! Oli arranged to meet the seller in Richmond, biking about 40 minutes to get there. He took a good look at the bike & bargained a bit with the guy. They loaded it into the seller's truck & drove it, & Oli's bike, back home. I was so excited to have a bakfiets just pop up like this--the 'barn find' that we had been dreaming of--though a little nervous about fixing the bike up. It had clearly been in a collision, which bent the front forks back & to the side to the point the front wheel would not turn. The rest of the bike seemed in good shape, but I was still holding my breath until we could get Clint, our bike mechanic (he owns the bike side of Tandem Bike Cafe) to look it over. I spent at least an hour cleaning the bike on the second day we had it. It took a lot of work, sweeping, vaccuuming & wiping all the dirt, dust, grease, paint, & sawdust. Under the layers of grime, the paint job was in great shape & the box only had a couple of scrapes & a couple bits of hardware missing. Then later that day, the guy we bought the bike from stopped by with what he thought was a part of the frame lock (it wasn't--must have been from a different bike) AND A RAIN CANOPY for the bakfiets! Considering what we paid for the bike, we weren't expecting this. Rain covers usually go for $350-450, so you can imagine how thrilled we were. Clint came over the next day to look over our bike & managed to 'cold fit' (aka bend using a chunk of pipe) the forks back to the point that the front wheel was freed & the bakfiets was sort of rideable. I say sort of, because it is still really wobbly & not really safe. But we each rode it around the block & it was amazing! The bike feels much lighter than it looks & even with the wonky fork, the steering wasn't that bad. The shifters (internal gear hub Nexus 8 speed) seem to work fine & the brakes are functional. Love the full chain case: I can do maxi skirts! 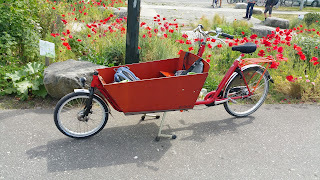 I googled the brand, & found the only Canadian distributor of Bakfiets.nl: Urkai, in Burlington, Ontario. After a couple of phone calls with Marc of Urkai, I ordered a fork & some rubber feet for the kickstand, as it's missing one. A few days later, the package arrived from Urkai & I immediately started pestering Clint. 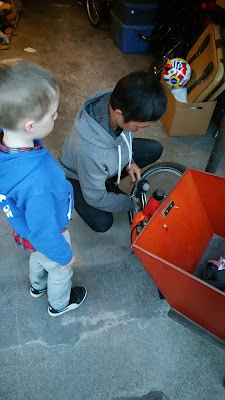 He fixed up the bike just a few days later, doing a full tuneup on it, even repairing the dynamo light system, & we had a fully functional Bakfiets! It's been just over a week, but I've ridden this bike so much--school dropoff & pickup, errands, shopping--that it feels like longer. I'm still getting used to how a longjohn rides, compared to a longtail. They are definitely different beasts. I'll probably write more on that later--a full on comparison between the Yuba & Bakfiets. For now though, we're all really in love with the new bike. 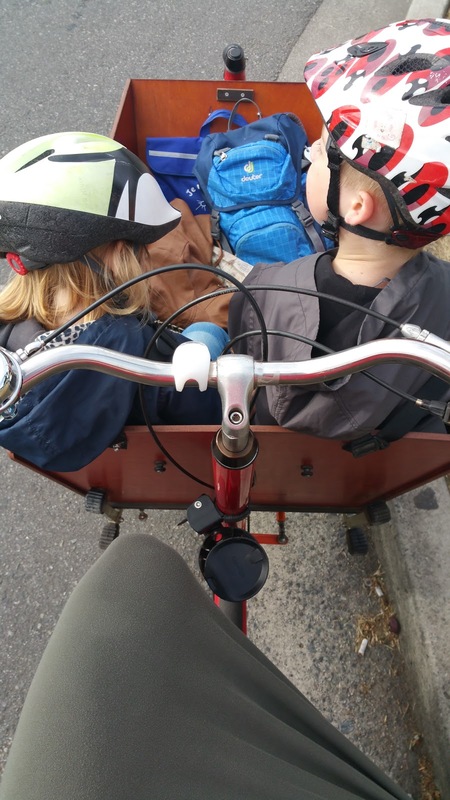 The kids haven't been on the Yuba since we got the Bakfiets, they demand to ride in it every time we go anywhere. 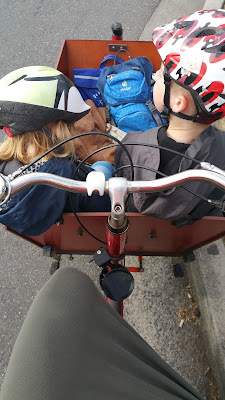 I was hoping to gradually get used to the heavier bike up hills with both kids, but I guess we're just going whole hog. I feel like I can see my quadriceps getting bigger each day. I'm going to have massively strong legs! That's great! They're so good in that they're fun and practical at the same time. I'm curious how it is going uphill with the 8 speed gear hub and weight in front. Love the red colour too. You found matching poppies for the picture.